Jefferson Rooney was the president of the United States of America. Little is known of his background or politics, other than he is widower and appears to be a deeply religious man. At some point in time he began a relationship with one of his staff members, Kelly Kline. Lucifer takes possession of President Rooney. President Rooney is sitting on his bed, hands clasped in prayer. He is unknowingly conversing with Lucifer, who is able gain consent for possession by the president. 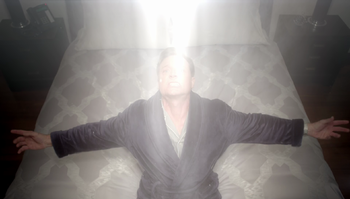 Upon consenting, President Rooney is bathed in a white light as Lucifer gains possession of his body. With Lucifer now in control, he begins conversing with President Rooney in his mind, telling him that as high profile as he is, he is going to need extra help making people believe he is actually the president. President Rooney obliges, and gives Lucifer the information he needs. In the midst of their conversation, a Secret Service agent overhears what appears to be President Rooney speaking to himself. When Lucifer sees him, he quickly kills the agent. 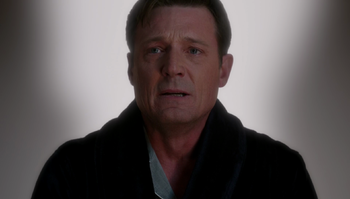 After Lucifer vacates President Rooney during his confrontation with Sam Winchester, Castiel remarks that the president is alive and won't remember anything. As Kelly begins crying over his unconscious body, Sam and Dean have Castiel get her out of the room while they check on the president. Unbeknownst to them, Castiel's mind manipulation on the Secret Service agent has worn off, and the boys are soon arrested for the attempted assassination of President Rooney. While briefing Agent Camp on the Winchesters' arrest and history, Agent Rick Sanchez tells Camp that only he, the arresting agents, and President Rooney know about the Winchesters' believed attempt on the president's life. It is revealed, however, that the last thing the president remembered after regaining consciousness was saying his nightly prayers. Sam tells Castiel that Ketch is looking for the "Newton Dee Hyperbolic Pulse Generator", reminding him that it was "the magic egg that kicked Lucifer out of the President." This page was last edited on 14 November 2018, at 12:05.